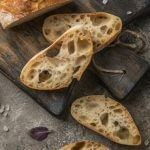 An Italian bread that has a crispy crust with an almost fried taste and wonderful traditional holes. Set up a couche which can be a cloth napkin scrap fabric, or smooth towel ( not terry). Mist the fabric with spray oil and lightly dust with flour. You can purchase the special linen proofing cloths and reuse them. Prepare two baking sheets by sprinkling each with corn meal and then topping with an oil misted parchment paper. In the mixer's bowl, stir the Poolish ingredients to a smooth batter -- it's like a pancake batter -- and leave it AT ROOM TEMPERATURE overnight. The goo will smell strongly of sour rye and yeast by-products. The next day, add the dough's dry ingredients -- either variation-- to the Poolish and using the mixer's beater blade mix roughly until just hydrated. Let rest for 20 minutes. After the rest , run the mixer for a minute or two then switch to the dough hook and continue to knead the dough for about 5 minutes or until it is fairly smooth and shows signs of elasticity. Flour your counter, very generously, and scrape the very wet dough onto the flour. Dust all over with more flour and use a scraper to help you roll the dough in the flour until it's coated all over. Leave for 10 minutes, sprinkle more flour around the dough and use your scraper under the dough to release it from the bottom. With floured hands and your scraper perform a stretch and fold. It is folded in thirds like you would an envelope. Mist with spray oil then dust the dough with flour. Cover with plastic wrap. Leave for 10 minutes then do the same procedure as above: sprinkle with flour, loosen the dough from the bottom, flour your hands and stretch the dough out, fold into thirds and again mist with spray oil and dust with flour and cover with plastic wrap. You will do the stretch and fold a total of 4 times with a 10 minutes rest period in-between. After the last stretch and fold, leave the dough to rise for about an hour growing about 1 1/2 to 2 times in size. Now it is time to cut the dough into 4 strips, being careful to degas them as little as possible. Shape the strips into fat loaves by stretching and folding into an envelope. Lay the loaves on the prepared cloth and bunch the cloth between the pieces to provide a wall. Mist the top of the dough with spray oil and dust the dough with more flour. Flour is your friend. Cover the cloth with a towel and proof for about 45 to 60 minutes. The loaves will increase about 1 1/2 times. Preheat oven to 500 o as the loaves are proofing. Invert the loaves out of the couche and stretch to the typical Ciabatta shape by gently grasping the ends of each loaf and pulling. Place each loaf as it is stretched onto the prepared baking sheet. Gently dimple the dough down with your fingertips to even out the height of the loaf. Slide the dough with the parchment paper onto the baking stone (or bake directly on the sheet pan). Spritz water onto the side walls of the oven being careful not to spray the light. Do this 3 times at 30 second intervals. After the third time lower the oven temperature to 450 F.
Bake for 10 minutes and rotate the loaves 180 degrees. Bake for a total of 30 minutes. The inside of the loaf should register 205 F.
Cool on racks for at least 1 hour before eating. I am ashamed to say that I've never been able to wait the full hour. The loaves will feel very hard and crusty at first but will soften as they cool. You can harden them up again by putting them in the oven and heating them up. We freeze our Ciabatta loaves immediately after they cool. When we are ready to eat the bread we put the frozen loaf into the over, heat the oven to 300 F then turn off the oven. The bread will have the same crispy crust and a wonderful chewy inside. There are some Ciabatta breads made with oil and milk -- those will keep longer. But we've never had a problem with the bread going stale-- it's not around long enough.